UPDATE 2000 GMT: President Assad has reassured Russian counterpart Vladimir Putin that the regime will adhere to the cessation of hostilities from Saturday. Syrian State news agency SANA said Assad, receiving a phone call from Putin, assured him of Damascus’ “readiness to contribute” to the halt of fighting. Russia had expressed concern about the Assad regime’s initial reticence over the US-Russian plan for the cessation announced on Monday. The Kremlin issued a similar statement about today’s conversation. President Putin also spoke with Iranian counterpart Hassan Rouhani and Saudi Arabia’s King Salman about the US-Russian initiative. Meanwhile, the opposition-rebel chief negotiator, Mohammad Alloush, said the High Negotiations Committee had not yet decided whether to commit to the agreement, expressing doubts that the deal will prevent Russian airstrikes in opposition-held areas. “How can (Russia) offer guarantees while it is part of the problem?” said Alloush in an interview with the pro-opposition Orient TV station. ORIGINAL ENTRY: After initial hesitation, the Assad regime has accepted the US-Russian plan for a cessation of hostilities to begin on Saturday across Syria. The Syrian Foreign Ministry said on Tuesday afternoon that the halt to fighting would be respected “on the basis of continuing the military efforts for combating terrorism against the Islamic State in Iraq and Syria, Jabhat al-Nusra, and other Al Qaeda-linked terrorist organizations”. The opposition-rebel bloc had “provisionally” accepted the cessation on Monday, but Damascus was silent, prompting signals by its Russian ally that it should comply. However, the regime’s formula of “other terrorist organizations”, first used by Moscow, leaves open the possibility of attacks on some rebel factions. Russia has called for leading groups Ahrar al-Sham and Jaish al-Islam to be labelled as “terrorist”. The opposition-rebel High Negotiations Committee has also raised concern that the pretext of striking the jihadists of Jabhat al-Nusra, who hold positions throughout opposition-held territory, could be used for continuing Russian and regime bombing of all areas. Despite the regime’s declaration, US Secretary of State John Kerry was cautious. “The proof will be in the actions that come in the next days,” he told the Senate Foreign Relations Committee. Kerry said the next month or two would show if parties were serious about the process. He asserted that President Assad would have to make “some real decisions about the formation of a transitional governance process that’s real”. Kerry’s statement brought concern from his partners in Moscow. “The Russian side is not aware of any ‘plan B’ that US is talking about. Intensive work on the statement was carried out, and it is necessary to hurl all effort into its practical implementation,” an unnamed Foreign Ministry official said. Turkey, a leading backer of the opposition and rebels, expressed doubt that the halt to fighting would be established. “I welcome this truce, but I am not very optimistic that it will be respected by all the parties,” Deputy Prime Minister Numan Kurtulmus told reporters in Ankara on Tuesday. “We hope that no one will try and carry out air strikes and that no one is going to kill civilians during the ceasefire.” he added. Ankara tried to shift attention to another dimension of the crisis, the ascendancy of the Syrian Kurdish Democratic Union Party (PYD) and its militia YPG in northern Syria. In the past month, the YPG and its allies have launched attacks on rebels, seizing parts of northern Aleppo Province near the Turkish border. Ankara considered the PYD and YPG to be led by the Turkish Kurdish insurgency PKK, which has waged an armed campaign for more than 30 years. Erdoğan said in a speech at the Turkey-Somalia Business Forum in Istanbul on Feb. 23, using the Arabic acronym “Daesh” for the Islamic State of Iraq and the Levant (ISIL). “As Turkey, we have been struggling with a separatist terror organization for 30 years. In our view there is no difference between terrorist organizations. We do not discriminate between al-Shabab, the Islamic State of Iraq and the Levant [ISIL] and al-Nusra, or between the Kurdistan Workers’ Party [PKK], the Democratic Union Party [PYD] and the Syrian Kurdish People’s Protection Units [YPG],” he added. A joint statement by the factions said the attack in the Snouber-Jableh area “caused the death and injury” of dozens of Russian officers. It said the bombing was on Sunday but the announcement of the operations was delayed until the safe returns of the attacking unit. Activists say more than 40 people have been killed in another Russian airstrike on the town of Ariha in Idlib Province in northwest Syria. 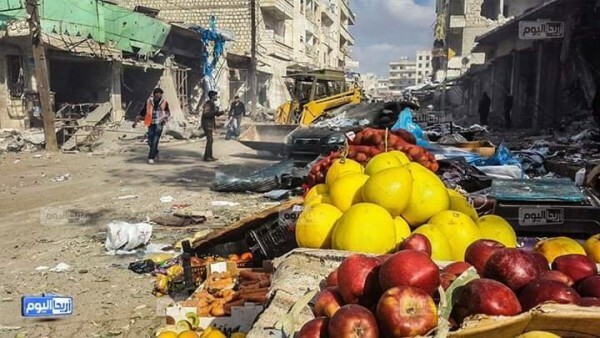 The bombs hit Ariha’s main market, according to opposition websites. Ariha has been regularly targeted by regime and then Russian warplanes since it was captured by rebels in May 2015. On November 29, a Russia attack on the market killed at least 44 people. Embedded with the Syrian military, Robert Fisk of The Independent offers a rare first-hand glimpse of Iran’s Revolutionary Guards fighting near Aleppo. “We would like you to write the truth about this place,” the commander said. “And I’m sorry we can’t allow you to see our lines.” There were more smiles from yet more Iranians who had turned up on motor cycles and in Toyotas. And then the commander went to his vehicle and came back with a large box of Arab sweets and handed them to us. How very Iranian of him. Iranian media have acknowledged the loss of almost 200 commanders and troops since October 7, when foreign-led offensives, enabled by Russian airstrikes, were launched. Most teachers have left the profession: some traveled abroad, others have been taken for reserve military service….Additionally, families are afraid to send their students to school due to a lack of security. The teacher said the alternatives are private education, with tuition beginning at SP50,000 ($265) and reaching SP100,000 ($530) per year, or home schooling. A rebel brigade has handed over four Afghan militiamen, captured in Daraa Province in southern Syria, to an international organization after the regime rejected a prisoner swap, according to pro-opposition site All4Syria. The men were held by the Aamoud Houran Division. The international organization was not identified. “The Afghan prisoners who were in the custody of division were handed over secretly to the organization via Jordan,” an anonymous source told the outlet. “This came after Iran and regime leadership refused to exchange the prisoners for the release of detained women and children from Houran, specifically residents of Busr al-Harir, from Bashar al-Assad’s prisons,” he asserted. The source said Aamoud Houran commanders were split over the decision to hand over the prisoners without “receiving anything in exchange”; however, the Division’s leader Colonel Hassan al-Hariri, ruled in favor of the transfer. Iran has recruited Afghan immigrants to fight in Syria, offering money and permanent residency and reportedly threatening deportation if they refuse. Many of the men fight in the Fatemiyoun Brigade, formed in late 2014 and commanded by officers from the Iranian Revolutionary Guard Corps. The Afghans were captured during a regime offensive which made limited gains south of Damascus last April.